While Florida, with its abundance of the necessary natural resource, is poised to become a leader in solar energy, it still lags behind the rest of the country. One man wants to change that. 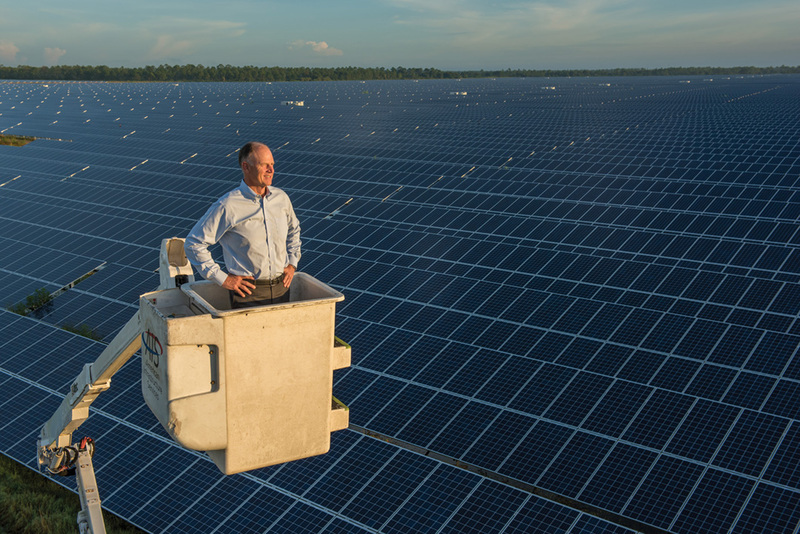 Solar visionary and Babcock Ranch founder Syd Kitson overlooking the solar field he erected in partnership with Florida Power & Light; Photography by Carlton Ward Jr.
As you drive down state Route 31 through eastern Charlotte County, the Florida of yesterday and the Florida of today blend together: Agricultural plots spill into gated communities interspersed with cattle and industrial spaces. About 15 miles east of Fort Myers, the entrance to Babcock Ranch welcomes visitors with wide boulevards and roadside advertisements adorned with lights that hang below solar panels. Near Founder’s Square, which serves as the core of the new planned community, contractors install a set of rooftop panels atop two pavilions. Along the serpentine ribbon of pavement, model homes are cropping up alongside cinderblock skeletons and empty lots. Around the square lie modern, modular buildings painted shades of sienna, gray and tan. The structures house Babcock Ranch’s school, general store, coworking space, outfitter’s shop, offices, medical center and restaurant. Babcock Ranch’s spokeswoman Lisa Hall says that much of the design was intended to make the community look like it belonged, but it seems fair to ask if anything belongs here in a rather wild, untamed part of Florida. Donna Aveck Babcock Ranch’s third resident, says that, when the model homes opened to the public, “We ran out here.” Jim, her husband, adds that he saw the appeal of Babcock Ranch as a “nod back to earlier, simpler times,” when you knew neighbors and could ask them for a hand. They plan to grow old here. 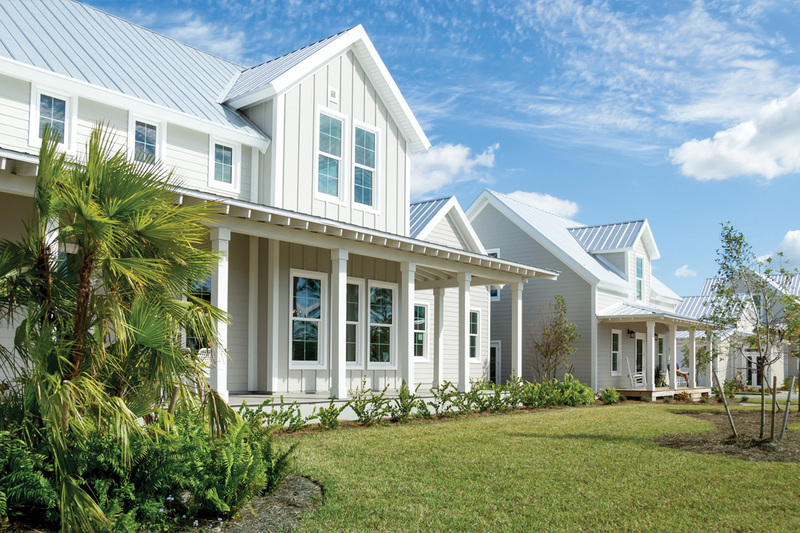 Babcock Ranch welcomed its first residents in early 2018, and it seems as though the development could be a turning point in the history of solar energy in Florida. Columns of diffused light pour down over the mounds of fill dirt that stretch off to the edge of the forest, and a fleet of dump trucks beyond the town square rumbles away. Farther south, thunderheads loom. 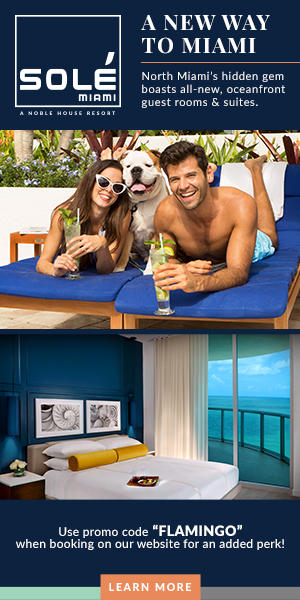 As visitors can see, the nascent development suggests the arrival of sunnier, greener days in the Sunshine State. 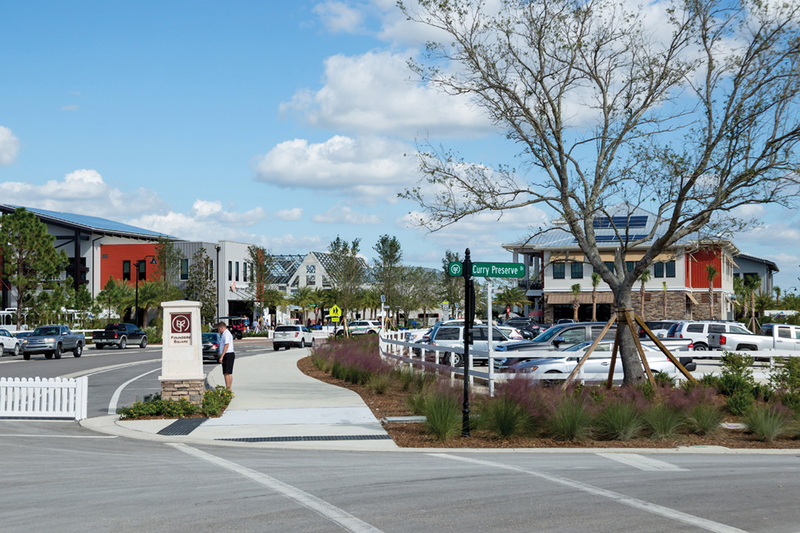 Twelve years later, Babcock Ranch’s first residents have moved into the fledgling development, and folks are eager to see whether Kitson & Partners has made good on its promise. 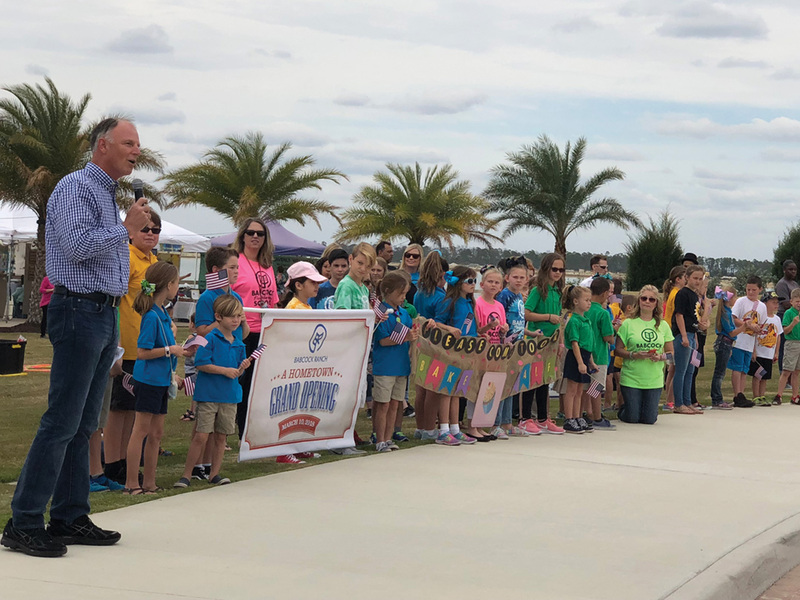 The opening of Babcock Ranch also serves as an opportunity to better understand why the Sunshine State lags so far behind the rest of the country when it comes to solar energy. 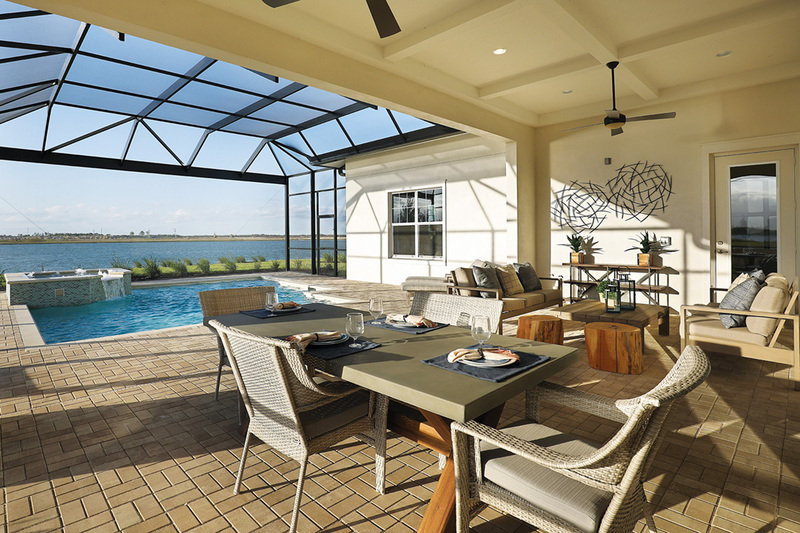 After all, Florida ranked third in the U.S. for rooftop solar potential in 2017, but fell far behind in installed capacity, according to the Solar Energy Industry Association. Florida Power & Light Company—the state’s largest electric utility company—currently produces about 930 megawatts of solar power, enough energy to run over 100,000 homes. That’s about 1 percent of the company’s total output. Nearly all of the energy produced by the company comes from natural gas and nuclear power plants. 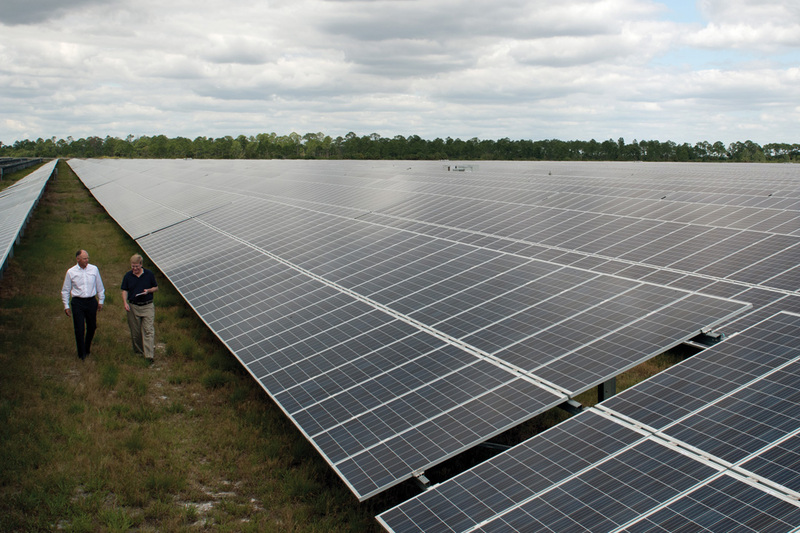 By 2023, Florida Power & Light hopes to surpass 4 percent in solar production. By comparison, in 2016, 14 percent of the electricity generated in California came from solar power plants and rooftop solar panels, serving more than 5.4 million homes, according to the Los Angeles Times. Will Babcock Ranch tip the scales in Florida? The Babcock Ranch Solar Energy Center is the size of 300 football fields; Photography by Carlton Ward Jr. In 1914, as the slow creep of development spread across Southwest Florida, Edward Babcock, a lumber magnate and former mayor of Pittsburgh, bought the property that is now Babcock Ranch, thinking that it held plentiful game and could serve as a reason to expand his lumber empire south. In the 1930s, his son Fred started farming plots of the land, mining for limestone and offering tours of the wild property. Today, that tradition is carried on in Babcock Ranch’s ecotours. Buses that once carried schoolchildren and later shuttled migrant workers now cart around visitors hoping to see the “real” Florida. After Fred Babcock died in 1997, his heirs tried to sell the property to the state in order to protect the environmental corridor, spanning from Lake Okeechobee’s western edge to Charlotte Harbor. (In 2017, a female Florida panther traveled through the corridor, crossed the Caloosahatchee River and gave birth to a pair of kittens, the first to be seen north of the river in over 40 years.) The state made an offer, but the deal hit a snag: For tax reasons, the Babcocks wanted the state to acquire the land by purchasing stock in the holding company through which they owned it, but the state constitution prevented it from doing so. In 2005, the deal with Kitson got underway, and after pen met paper the following year, the state returned to the table to purchase 73,000 acres from Kitson with $310 million of state funds and $40 million from Lee County. It was the largest land conservation buy in Florida’s history. Eighty percent of the property was to remain undeveloped. The remaining 18,000 acres would give way to Kitson’s vision, but as is often the case, there was much more to this story. In 2007, when Kitson heard that Armando Olivera, Florida Power & Light’s former president and CEO, was scheduled to speak before a legislative committee in Tallahassee, he hopped on a plane from West Palm Beach to sit in on the hearing. Afterward, Kitson trailed Olivera into an elevator, introduced himself, explained his idea and pitched a partnership to build a solar power plant at Babcock Ranch—one that would concurrently power the town and Kitson’s ambition. With enough charm to beguile a rattlesnake, Kitson won Olivera over, and, in 2009, after a long road of negotiations, the partnership was finalized. “He listened,” Kitson says. When Kitson first touted his idea around Florida, people responded with blank stares and condescension. 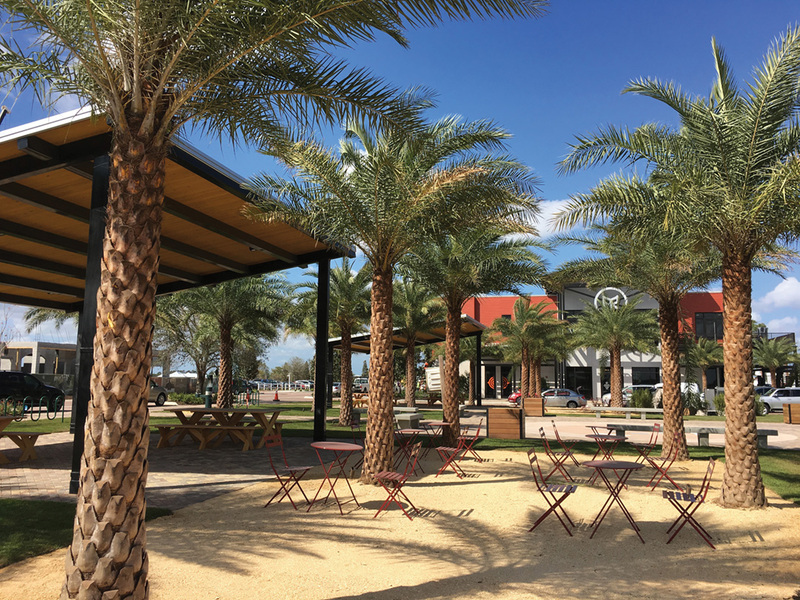 But in March this year, from his sparse corner office overlooking Babcock Ranch’s Founder’s Square, he could see prospective residents licking ice-cream cones while children’s laughter filled the square. Folks were arriving in droves to see the place, and from Kitson’s vantage point, the covalent bond of the town was assembling before his eyes. At well over 6 feet tall, Kitson looms over most of his peers, but his honest eyes and kind smile lend him a down-home, almost Southern air, belying his Northern roots in New Providence, New Jersey. From 1980 until 1984, Kitson played for the Green Bay Packers as a guard until he was released and subsequently signed with the Dallas Cowboys. After leaving the NFL, he went into real estate development, working his way up to make partner at the commercial real estate firm Gale, Wentworth & Dillon. In 1999, he bought out his partners, and, a few years later, moved the operation to Florida, renaming it Kitson & Partners. In 2016, the solar energy industry employed five times as many people as coal-fueled power plants did, according to the U.S. Department of Energy. And in light of those figures, the question has become how utilities will respond to the shift and whether they will embrace or forestall the rise in consumer and utility-grade solar. But why hasn’t solar power been a priority in Florida until now? In an interview with PBS, Kelly Fagan, a construction project manager for Florida Power & Light, said that nuclear and gas plants are the “backbone” of energy production in the state. In other words, with each slab of concrete it pours, every transmission line it installs and all other capital expenditures, Florida Power & Light is able to increase its profit. The Florida Public Service Commission, the regulatory body charged with oversight of utilities in the state, allows Florida Power & Light and other utility companies to raise customers’ rates to reach a predetermined rate of return—sometimes as high as 11.5 percent—on certain infrastructure spending. If it makes money building, why doesn’t Florida Power & Light just turn from gas and nuclear to solar? Couldn’t it profit from the construction of solar power plants? In theory, yes, but natural gas power plants currently account for over two-thirds of Florida’s energy production, and the change would be drastic and messy for utilities like Florida Power & Light. Solar power’s merits extend well beyond extra pocket money. It bolsters the grid, it makes communities more resilient by allowing them to generate and store their own electricity, and above all else, it limits emissions that are fanning the flame of climate change. Take Florida’s fallout from Hurricane Irma last September as an example. The storm left more than 12 million without power and led to the deaths of 12 residents at a nursing home in Hollywood, later ruled homicides. The tragedy left customers wondering what could have been done to avoid it. And in Vermont, the utility company Green Mountain Power has installed battery systems in customers’ homes in order to reduce dependence on the grid. In Florida, the ability to store energy to use during outages would make not only communities but also hospitals and shelters more resilient in the face of natural disasters. Hurricane Irma was a chilling testament to the fact that Floridians need to do more to prepare. There are few green energy projects on the horizon. Natural gas power plants figure large in the plans that Florida Power & Light is proposing to the Public Service Commission. “That’s the tell,” Pomerantz said. The company wants to build natural gas power plants because the construction is more expensive, which increases its revenue, he says. Over time, he adds, natural gas power plants also cost more to maintain than solar farms, and customers end up paying for the difference. As for Babcock Ranch and its role in the shift, some critics see it simply as a land deal, an ornate, low-cost source of branding for both parties. While it lends Florida Power & Light and Babcock Ranch a nice image, what some write-off as “greenwashing,” the real story here is about the battery storage on site at Babcock Ranch and how that will develop across the state. Utility-scale solar storage is the goal, so all eyes are on how Florida Power & Light and Babcock Ranch will push each other to make battery storage a reality. The resilience that battery storage provides is what attracts so many people like Pomerantz to solar in the first place. “All of this hinges on utilities leading or getting out of the way,” he says. “In March 2018, FPL created the nation’s largest solar-plus-storage system,” Stephen Heiman of Florida Power & Light writes of Babcock Ranch’s 40 megawatt hours of storage capacity, which can power several thousand homes and be dispatched for up to four hours. A bit up the road from the town square at Babcock Ranch, sandwiched between fields of sod and stands of trees, Hall, the spokeswoman for Babcock Ranch, stares out at the solar field where Florida Power & Light has built a viewing tower to better see the expanse of lucent, lapis lazuli–hued rectangles marching off into the pines. Here, the issue of solar power in Florida is made physical. A shadow from the clouds overhead passes across the two vast fields of panels. Without the shaded shapes moving across the body of blue, an onlooker would be hard-pressed to have any sense of just how far they extended. Hall says that the plant occupies 440 acres, comprises 343,000 panels and generates 74.5 megawatts of electricity, but the size doesn’t quite compute. But the length of time that it takes for cumulus clouds to pass over the field demonstrates the magnitude of the solar farm—larger than 300 football fields combined. The field, along with Florida Power & Light’s 13 other solar plants across the state, is a stand-in for the insurmountable challenge that the state faces, and it’s hard to imagine enough of these solar power plants to power the entire state. To be sure, every means of energy production, including solar, has flaws. Solar requires large amounts of space for the panels to capture light, hazardous materials are used in panel production and carbon-dioxide emissions are created by transportation of the panels. There’s little debate, however, that solar power generation is much cleaner than traditional power plants. Just off to the side of the tower, quietly hiding behind a chain-link fence, sits a squat set of pods encasing hundreds of batteries. The pods take up less space on the ground than the tower itself. With these batteries, solar energy can be made available after the sun sinks into the Gulf of Mexico and on cloudy days when the plant’s output dips. There are plenty of shiny bells and whistles spread out over the property—from ibis and alligators to new-fangled homes and chic eateries—but this drab, rather unobtrusive set of boxy forms is perhaps the most impressive—certainly the most important. Without solar storage, the solar solution is incomplete. Still, “FPL is working feverishly to build as many new natural gas plants and gas infrastructure as they can,” Glickman says. “FPL’s commitment to solar is very low,” she adds. The company’s target of producing 4 percent of its total output via solar power by 2023 is unambitious when compared to California, which aims to derive 100 percent of its energy from renewable sources by 2045. “We can do so much more,” Glickman says. What ultimately hurts the consumer are policies that make it harder for individual families and businesses to install rooftop solar panels. In November 2016, an amendment misleadingly titled “Rights of Electricity Consumers Regarding Solar Energy Choice” appeared on the Florida ballot. Backed with $21 million from Florida’s utilities, the group behind the amendment essentially sought to impede competition and prevent customers with rooftop solar power from selling off their excess electricity. Florida voters voted no on the amendment, and that choice underscored the groundswell of momentum behind consumer-scale solar. “It’s happening whether they like it or not, because solar makes sense economically,” Glickman says. In Florida, utilities might continue to stave off the solar revolution, but Glickman is optimistic. “The most important thing to me is the finance piece,” she believes. That’s what will open the spillway of solar in the Sunshine State. 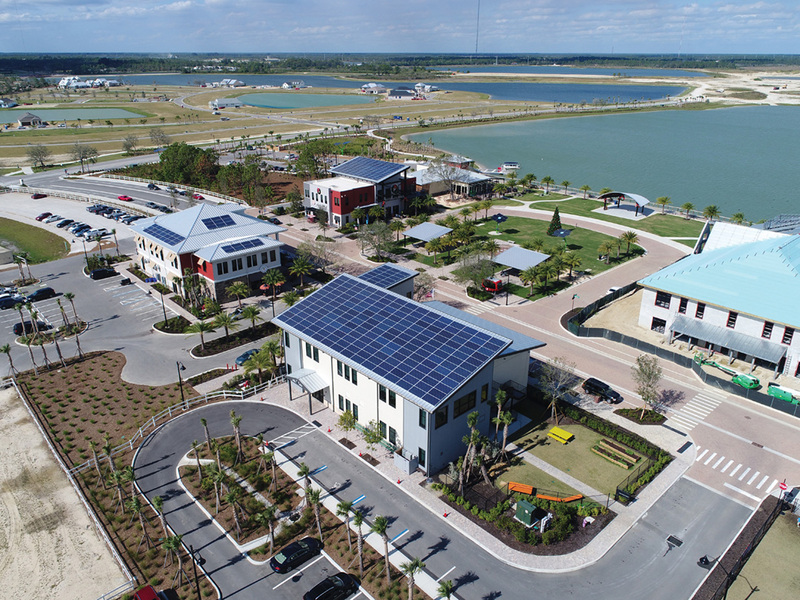 And now, with a litany of solar co-ops, financing options and increased public familiarity with the technology, consumer-scale solar is finally accessible in the Sunshine State, and it’s here to stay. Back at Babcock Ranch, on a remote slice of land situated between the preserve and the ranch, the whistle of a northerly wind can be heard pushing through the acres of tall pine trees, while the rumble of a distant bulldozer disturbs the peace. In this moment, two Floridas face off: one turning from stands of pines to glistening cookie-cutter cul-de-sacs, as it has for a hundred years, but now in a way that might change the state. 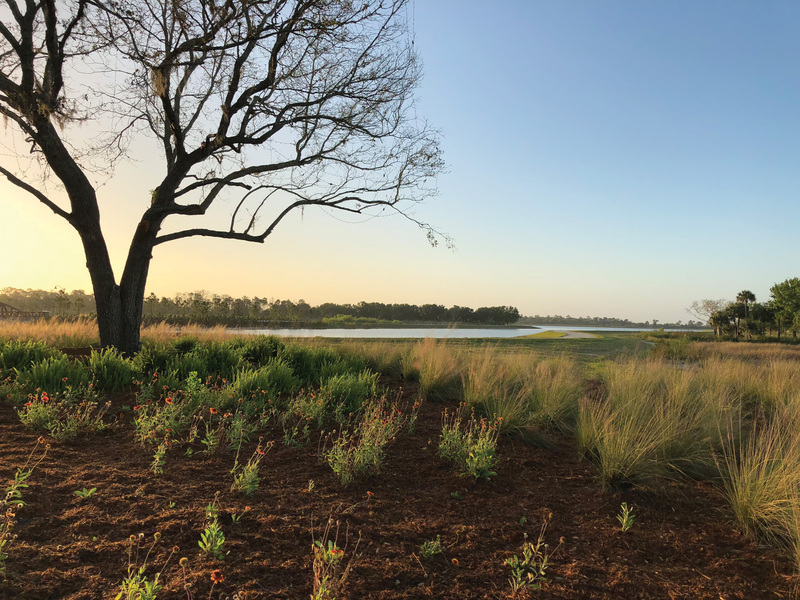 The other Florida, still wild and rustling, flourishes down coquina two-tracks, past ranch gates, far from the major highways that cut across the state. Standing at the vortex of two stark realities, the natural and the manmade, the question arises: What could Florida become in another hundred years?